From Fourmile Lakes to Navajo Dam, the Ski and Bow Rack will get you ready to go with expert advice and top of the line outfitting! 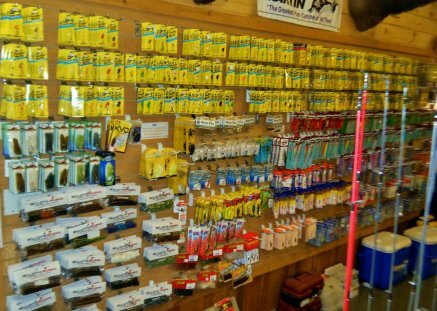 Ski & Bow Rack has the widest selection of fishing gear for fly fishing, spin fishing, ice fishing or bait fishing in Southwest Colorado. Our fly fishing, bait, and tackle supply is the largest in the area, with great brands like Anglers Accessories, Black's Flies, Bosstin, Loon, New Zealand Strike Indicator, Orvis, Pacific Fly, R.L.Winston Rods, Ross Reels USA, Ross Worldwide, Scientific Anglers, Shimano, St. Croix, SIMMS, Solitude Fly, Trout Hunter, Panther Martin, Dardevle, Gamakatsu, Heddon, Kastmaster, Luhr Jensen, P-Line, Power Pro, Rooster tail, Rapala, Blue Fox, Mepps, The MEASURE NET, Rebel, Strike King, WilletteWorks, Zoom and many others. Our rods & reels include Orvis, R.L. Winston, Ross, Scientific Anglers, St. Criox, Echo, LEW's, Shimano, Quantum, Eagle Claw, the Ugly Stick, Okuma, and Zebco. We even have something for the little ones: Disney rods from Mickey Mouse to Tigger! "Largest Selection of Fishing Tackle in the Area." Stay up to date on all the local fishing activity by coming into the shop or calling us at 970-264-2370. "FREE!" 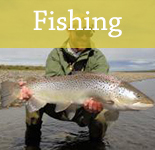 Fly Fishing/Fly Casting Lessons Every Saturday in the summer months (June-Sept.) from 10 am. to 12 pm. (Limited to 6 people please call to reserve a spot) (970)264-2370. Ski and Bow Rack has Southwest Colorado's and Northern New Mexico's Best Guided Fishing Trips with the most experienced guides in the area! Please call today for more information 970-264-2370 or contact us here. Full-Day Guided Trips include lunch & drinks, transportation, and all fishing equipment. Half-Days do not include lunches. *Not Included in Prices on Guided Trips: Fishing License or Gratuities for Guides. The Snow Angel Ranch is one of the best kept secrets of the area. Enjoy catching trophy-sized trout of all four species out of one of the three Lakes or in the creek while feeling like you've taken a step back in time. Very beginner friendly and easy access with very positive results. The Navajo River is an amazing trout stream located 23 miles from Pagosa Springs. With some habitat improvements done on the stream, expect large trout of all four species. The Navajo River is a beautiful river valley with trophy-sized trout and here Grand Slams are possible. This location is more suited for intermediate to advanced anglers in fair to good physical shape, though beginners can benefit greatly from this once in a lifetime experience. Ski & Bow Rack is permitted to guide some of the best public waters in the San Juan National Forest, including Williams Creek, the Piedra River, Weminuche Creek, the East Fork of the San Juan River, Turkey Creek, and many others. The National Forest boasts a wide variety of fishing opportunities, from small creeks brimming with eager 6-14" wild trout, to larger streams home to trophy fish over 20". Clients who fish these waters have a good chance of catching the "Colorado Grand Slam" - rainbow, brook, brown, and cutthroat trout in a single day. Many of these fisheries are easily accessible by vehicle, but there are also some excellent options for single-day hike-in fishing trips for those who would like to venture a little further into the backcountry. San Juan River in Downtown Pagosa Springs, CO. is managed by the CPW & Town of Pagosa Quality Fishing Project. Currently the river has had massive amounts of stream habitat work done through town and is stocked with Rainbow Trout from fingerlings - 12 inches by CPW and 12"-20" Rainbows planted by the PQFP with Browns stocked at fingerling size by CPW or Wild. There are 2 miles of public access through town with a great pool-to-pool ratio. You can expect to hook Rainbows and Browns averaging 12"-20" with good numbers of Wild & Holdover fish mixed in some up to 24+" 5+lbs. or bigger. A few 10-15lb. fish are caught each year in Downtown. If you are short on time, want to learn to fly fish, or just learn more & tune up your skills on public, more-pressured waters? Please consider booking a guided trip with one of our expert guides. Hey, you may catch the Trophy Trout of a Lifetime! Anyone can easily fish the San Juan in Downtown no matter fishing ability or physical ability; very friendly access and fishing. 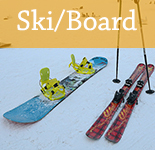 *Ski and Bow Rack guides provide only the best fishing equipment from Korkers, R.L. Winston, Ross Reels, Simms, Orvis, & Scientific Anglers. * Ski & Bow Rack is an equal opportunity employer and service provider operating under special use permit on the San Juan National Forest. INCLUDES THE USE OF AN ORVIS FLY ROD, REEL, AND LINE. The purpose of Session 1 is to help develop the skills and understanding necessary for basic fly casting. There will be no fishing involved in this class. Remember, it is extremely important first to learn proper fly casting in order to become a proficient angler. 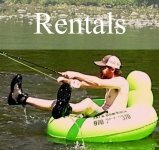 INCLUDES THE USE OF AN ORVIS FLY ROD, REEL, LINE, LEADER, 3 FLIES (NYMPH, DRY, AND STREAMER) BOOTS, WADERS, AND A ONE-DAY FISHING LICENSE. The purpose of Session 2 is to help develop the skills and understanding necessary for basic fly fishing. The session will give instruction on stream etiquette, tying knots, rigging the leader for nymph and dry-fly fishing, and basic presentation for ponds, lakes, and streams. **In order to enroll in Session 2, the student must effectively be able to straighten out 18 to 29 feet of line with proper loop control, while maintaining proper fundamentals. 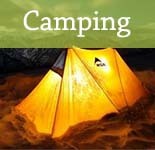 INCLUDES THE USE OF AN ORVIS FLY ROD, REEL, LINE, WADERS, BOOTS, AND A ONE-DAY FISHING LICENSE. The purpose of Session 3 is to help develop the skills and understanding necessary for technical fly fishing. 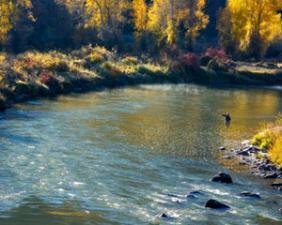 This session will give instruction on entomology, "reading the water", wading streams and rivers, techniques for nymph, dry, and streamer fly fishing, and an understanding on how to play and release a fish. Anglers who enroll in Session 1 and 2 on the same day will have lunch provided for them at 1:15pm. Anglers who enroll in all three sessions will be fitted with waders and boots, and begin with session 1. Also, these anglers will be able to use the fly fishing equipment until 8:30am the following day with no additional rental fees. Unless previously specified, all fly fishing equipment will be turned into Ski and Bow Rack immediately after each session. A friendly reminder: this is not a guided fly fishing trip. This is an Orvis-endorsed fly fishing school which instructs anglers how to fly fish. 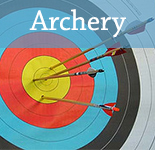 ***In order to enroll in session 3, the student must effectively be able to loop control while maintaining proper fundamentals, to roll cast to a distance of 15 feet and to be proficient in false casting.